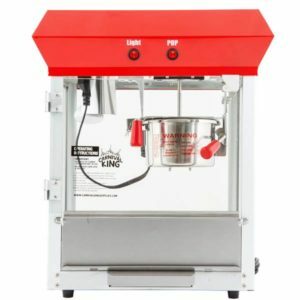 Whether choosing an industrial popcorn machine for use in a movie theater or concession stand, looking for commercial popcorn machine reviews to help you find the best fit for a convenience store, or simply shopping for the best popcorn machine for home theater use, you have several top products to consider. So, before you do invest in something that is over-priced, and won’t do the job you want it to do, these are a few options to consider when reading commercial popcorn machine reviews, to find the right fit for commercial (or home theater) use. The antique style reminds memories of the earliest days in ball games, carnivals or cinemas! These high-quality machines feature stainless steel food zones, easy-clean stainless steel kettles with water, a separate heating deck, old-maid drawers (for unexploded kernels), tempered safety glass panels and a business leading 8-ounce kettle. It is built with very durable materials, including powder coated steel and stainless steel food areas, tempered safety glass walls, vibrant, richly pigmented paint quality, and a powerful, commercial grade motor. The machine is built with heavy duty stainless steel and thick tempered glass walls (not Plexiglas / plastic walls). It has a flexible capacity to use with up to 16 oz of kernels per batch. The machine is Ideal for large venues including convention centers, arenas, and amusement parks and it offers a larger practical popper at a competitive value position. The unit is very tall, with a compact footprint. This popcorn machine works very well. It is well made, and pneumatic tilt is an excellent feature. The light warns it’s hot enough to put in the popcorn is also convenient. If you are looking for an excellent quality popcorn machine in the market, this is the best option. The “big brother” to the PM470 model is a great option if you have a little more money to spend when investing in a popcorn maker for commercial or industrial use. It features a 120 V, 850 W, 8 oz capacity popping system, allowing you to pop more, in a much shorter period of time. With double the kettle size, you can pop more popcorn in the same period of time, and it can remain in the warming deck in the same manner, without having to worry about it drying out or getting cold if it isn’t sold immediately. Carnivals, movie theaters, convenience stores, and nearly anywhere else you want to sell popcorn, this machine is going to do the job quickly, and is going to offer a larger capacity kettle popper, so you won’t wait forever for popcorn when your stores are busy. With a 4-minute heating deck, you can turn on the machine, and it is ready to go in no time at all. It has a very low noise when the motor is running, so you will barely notice it is on in a quiet setting. A light and warming deck are going to maintain the perfect temperature for your popcorn which isn’t sold, for extended periods of time so it will not dry out. It will keep the popcorn at the perfect room temperature for several hours at a time, so you also eliminate the waste of popcorn when it is not sold immediately after being popped. It has non slip rubber feet on the base as well. So this is ideal if you are going to set it up on a counter, and do not want to have the worry of scratching or damaging the counter with the stainless steel base of the machine. It features a safety circuit breaker as well, which is perfect for the commercial setting. It won’t burn out, nor will it cause outages in the event of frequent and heavy use of the machine. A clear plastic window allows customers to see the popcorn being made and helps increase sales as well. A reasonable price point and high-quality material base and finishes make this a great option for commercial businesses looking to sell popcorn. Great Northern Popcorn Machine 8 oz. Great Northern Popcorn Company has an excellent reputation for its quality products. You may find some various models of popcorn machines in the market. Here you can use all types of oils and popcorn. Coconut oil is even good. The size or dimensions are 14.4″ L x 13.6″ W x 22.8″ H. It works on standard 110v. It has built-in warmer light, tempered glass (all), heavy-duty powder coated steel and stainless steel construction. It is well packaged and heated by a heat lamp. He keeps it warm and cool for several hours. The kettle can be removed and easy to clean. You can find popcorn oil in the grocery store. It’s 1420 watts. Stylish like the poppers you see at the local cinema. Can display up to 147 servings of popcorn per hour (1 ounce of popcorn per serving). The door made by Plexiglass. Easy to clean. It comes with a yellow plastic scoop. This machine is completely assembled. There is no plastic involved in the components of the kettle. The kettle itself is made of coated aluminum, and the instructions detail how to clean it properly so that the coating lasts a long time. The only plastic on this complete unit is the plexiglass doors and the drain handle of the kettle. With a 4 oz capacity size, this might not work for a movie theater but is a good option for convenience stores, gas stations, or even a small home theater you have set up in your home. It features a kettle which only takes four minutes to heat up. This guarantees it is always ready when you need to pop up a batch, and can’t wait for the kettle to heat up for fast-paced use. As it starts to pop, the popcorn will fall onto the warming deck, where it can remain for a fairly long period of time without cooling off. The warming deck works in conjunction with a light system, so the popcorn will remain fresh until it is ordered to be served. It features an easy tilt mechanism, so the popper won’t overfill or topple over in the event you put too many kernels in it. And, the bright red top not only stands out, but makes it ideal for a small movie theater, or even an at-home movie theater you want to mimic in your home. It has an extremely quiet operational system and silent motor, so you will barely notice it is on and popping, even if it stays on all day. The kettle can be removed which makes it easier to clean when not in use. Simple in design, elegant, and reasonably sized popping capacity, make this a great option for a home theater, or convenience store. Although it probably won’t suffice for a huge movie theater, it is a good option for smaller commercial and industrial businesses searching for a popper. If you have ever seen a commercial or industrial popcorn maker at a movie theater, it is highly likely this was the brand name. It is not only reputable but can withstand heavy use in even the busiest of commercial settings. A 6 – 8oz popper is going to get the job done even in the busiest of locations where you are selling popcorn. It can pop up to 160, 1 oz servings per hour. It has an aluminum disc at the base to ensure an even cooking/popping distribution. Sleek stainless steel frame, tempered glass design, and easy open doors/cabinets allow you to move quickly and increase sales in a movie theater or high volume sales area. A removable kettle makes clean up a cinch, and the heating disc helps maintain temperatures for several hours, so even if you aren’t in peak sale times, popcorn will not go to waste with this machine. Nemco also supplies for your restaurant or food service business and you may find useful tools from them here. When the time comes to choose the best industrial popcorn machine, you have several options from which you can choose as a business owner. So taking the time to read commercial popcorn maker reviews, compare models, and compare the capacities and design, are a few ways to find the right machine for your business or home theater. These are a few top models to consider, for high volume use, and for the great features and design, they are going to offer for any commercial setting you are selling popcorn in. 1. How many popcorns do I need to put in a popcorn machine? Use salt to personal taste (or about 1/2 teaspoon per 1/4 cup of popcorn). 4-ounce popcorn machine: use 1/4 cup of oil and 1/2 cup of popcorn. 6-ounce popcorn machine: use 1/4 cup of oil and 3/4 cup of popcorn. 2. How much oil do I use in a popcorn machine? 3. Which oil is best for popcorn? Canola oil and Soybean oil. Like canola oil and soybean oil does not have a strong flavour, but it is excellent for popping beans. 4. What is the ratio of oil to popcorn? Add two tablespoons of vegetable oil and three popcorn to the pan. Cover and heat the oil covering medium-high temperature. Add a few shakes (about 1/8 teaspoon) of popcorn salt to 1/2 cup of popcorn kernels. The oil is ready when the three seeds in the pop pan. 5. Can I use olive oil in a popcorn machine? Whichever popper you use, keep the popcorn uncovered as soon as popping stops. You may want to try olive oil, a nutritional equivalent of canola oil because it is rich in good monosaturated fats and gives popcorn a richer flavour, but olive oil has a low smoke and tends to burn quickly. 6. Is it right to eat on a diet? A meal plan for a 21-day diet is based on low-calorie standards such as baked fish and fresh vegetables. Served without salt or butter, a cup of fluffy popcorn is plentiful and has a high fibre content, but it only has about 30 calories. Addicts can feed popcorn sandwiches and says still lose weight.